In his new book, The Grand Design, Stephen Hawking that the universe does not require a creator God: the laws of physics as we understand them are sufficient to account for the creation, including the Big Bang. livescience.com – Thu Jul 1, 4:55 pm ETWhile the hole in the Earth's protective ozone layer is slowly healing, its recovery might have a downside, scientists say: Climate change could change wind patterns and send ozone from high in the atmosphere down to the surface, where it is a major component of smog. The first scientific results from the Herschel infrared space observatory are revealing previously hidden details of star formation. New images show thousands of distant galaxies furiously building stars and beautiful star-forming clouds draped across our Milky Way galaxy. One picture even catches an "impossible" star in the act of formation. Presented today during a major scientific symposium held at the European Space Agency in the Netherlands, the results challenge old ideas of star birth, and open new roads for future research. The mission is led by the European Space Agency with important participation from NASA. "Herschel is a new eye on a part of the cosmos that has been dark and buried for a long time," said the mission's NASA project scientist, Paul Goldsmith, at NASA's Jet Propulsion Laboratory, Pasadena, Calif.
Herschel's observation of the star-forming cloud RCW 120 has revealed an embryonic star, which appears ready to turn into one of the biggest and brightest stars in our galaxy within the next few hundred thousand years. It already contains eight to 10 times the mass of the sun and is still surrounded by an additional 2,000 solar masses of gas and dust from which it can feed further. "This star can only grow bigger," says Annie Zavagno, Laboratoire d'Astrophysique de Marseille in France. Massive stars are rare and short-lived. To catch one during formation presents a golden opportunity to solve a long-standing paradox in astronomy. "According to our current understanding, you should not be able to form stars larger than eight solar masses," says Zavagno. Read more at http://www.esa.int/esaCP/SEM7N7KPO8G_index_0.html . Herschel is a European Space Agency cornerstone mission, with science instruments provided by consortia of European institutes and with important participation by NASA. NASA's Herschel Project Office is based at JPL. 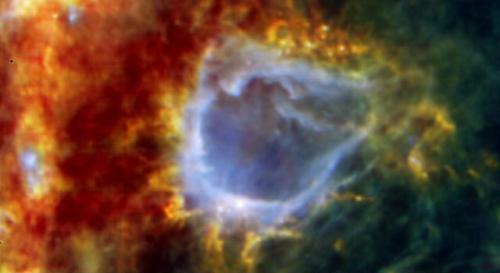 JPL contributed mission-enabling technology for two of Herschel's three science instruments. The NASA Herschel Science Center, part of the Infrared Processing and Analysis Center at the California Institute of Technology in Pasadena, supports the United States astronomical community. Caltech manages JPL for NASA. 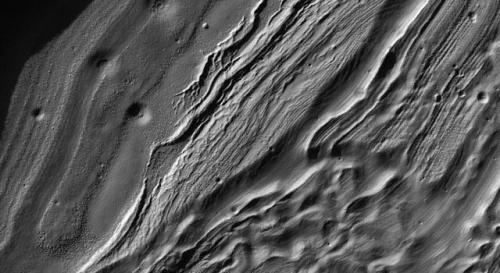 New images from more than 750 recent observations of Mars by an orbiting telescopic camera testify to the diversity of landscapes there. The images from the High Resolution Imaging Science Experiment camera on NASA's Mars Reconnaissance Orbiter are now available on NASA's Planetary Data System and on the camera team's website. The features visible in the images range from oddly sculpted terrain inside a giant crater to frosted dunes, deformed craters, old gullies and pits strung along fractured ground. This new batch brings the tally from the high-resolution camera to more than 1.4 million image products derived from more than 14,200 observations. Each observation can reveal features as small as desks in areas covering several square miles. The camera is one of six instruments on NASA's Mars Reconnaissance Orbiter, which reached Mars in 2006. For more information about the mission, see http://www.nasa.gov/mro.